An international initiative that encourages families everywhere to take their children to the local library! Participating in the 2019 Take Your Child to the Library Day? Please let us know! The official date for 2019 is Saturday, February 2, 2019 - the 8th annual Take Your Child to the Library Day. But TYCLD is flexible and customizable - celebrations may take place on any date(s) in February that suit your library, your community, and your goals. More information coming soon! WHAT IS TAKE YOUR CHILD TO THE LIBRARY DAY? Take Your Child to the Library Day (TYCLD) is an international initiative that encourages families everywhere to take their children to their local library. Launched in 2011 right here in Connecticut by librarians Nadine Lipman (Waterford Public Library, retired) and Caitlin Augusta (Stratford Library) with artist Nancy Elizabeth Wallace, TYCLD raises community awareness about the importance of the library in the life of a child, and promotes library services and programs for children and families. TYCLD is officially held on the first Saturday in February - but the date is flexible! TYCLD celebrations may take place on any date(s) in February - it's up to your library. The official date for 2019 is Saturday, February 2 - the 8th annual Take Your Child to the Library Day. WHAT DOES MY LIBRARY HAVE TO DO TO PARTICIPATE? Whatever you want! That's why it's so easy! You can have a special event or performer or story time. You can offer a craft project or a scavenger hunt or a prize just for coming by. You can put up special decorations or have party snacks. You can celebrate however you like, as long as it encourages people to take their child(ren) to the library. WHY SHOULD MY LIBRARY PARTICIPATE? It's really easy and flexible. It's a great way to demonstrate your library's importance to your community. It's an opportunity to market your library to non-users. You can be part of a national movement that raises awareness of libraries - and show your Connecticut pride because it started right here! And - you don't want to have to say "Oh sorry, we're not doing that" when someone shows up at your library looking for Take Your Child to the Library Day fun! ARE TAKE YOUR CHILD TO THE LIBRARY DAY MATERIALS AVAILABLE IN SPANISH? Yes! We have bookmarks in Spanish! More info below under Marketing - Printables. IS THERE AN OFFICIAL HASHTAG? YES! Please use #TakeYourChildtotheLibraryDay - it's long, but it gets the point across! The bookmarks and brochures provided below are designed to be used out in your community, not in your library. Distribute to any local agency/organization/business that serves children and families, so new users can discover your library on Take Your Child to the Library Day and beyond! Customize the back with your library's info, or use the generic version suitable for all! (1) Choose the customizable version of the back of the bookmark (in Word). (2) Fill in your library's event and/or contact info in the first text box. (3) Copy the same information into the other 3 text boxes. (4) Print double-sided on card stock, using the generic bookmark front. Bookmarks - Spanish. NEW!! 4 bookmarks per sheet. File includes both front and back. Print double-sided on 8.5x11 white cardstock. 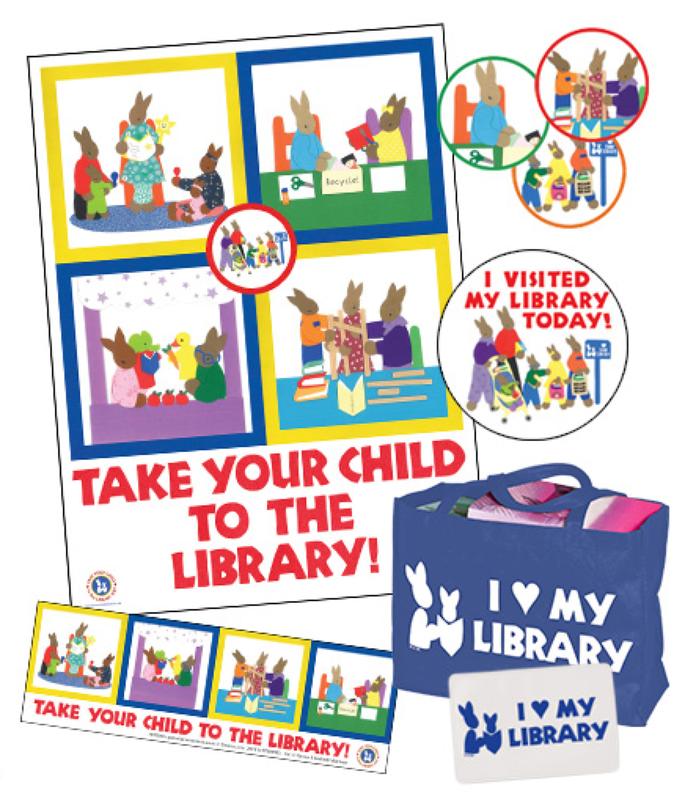 Thanks to a partnership among Take Your Child to the Library, Upstart/Demco, and CLC, a Take Your Child to the Library product line featuring original artwork by Nancy Elizabeth Wallace is available from Upstart/Demco! Available products include stickers, bookmarks, posters, bags, and library card holders. Your purchase of these products supports the work of CLC, along with Connecticut-based nonprofit organization Read to Grow. Take Your Child to the Library Day Program Guide - Written by former children's librarian Patti Sinclair and produced by Upstart, this 20-page guide is full of program ideas, printables, booklists, crafts, games, and much more! And it's free! Make Your Library a Part of the Take Your Child to the Library Day Initiative! - Demco Ideas & Inspiration blog. Overview, graphics, resources, success stories, links, more. Take Your Child to the Library Day press release 2019 - Sent to CT media outlets in 2019. Feel free to adapt! Take Your Child to the Library Day: When is it? What can I do? And why bother?!? Very informative and resource-filled brochure for libraries interested in learning more and getting involved. From NYLA (New York Library Association). Thank you to ALSC for collaborating with Take Your Child to the Library Day!